By default, billables may not come activated within your account. 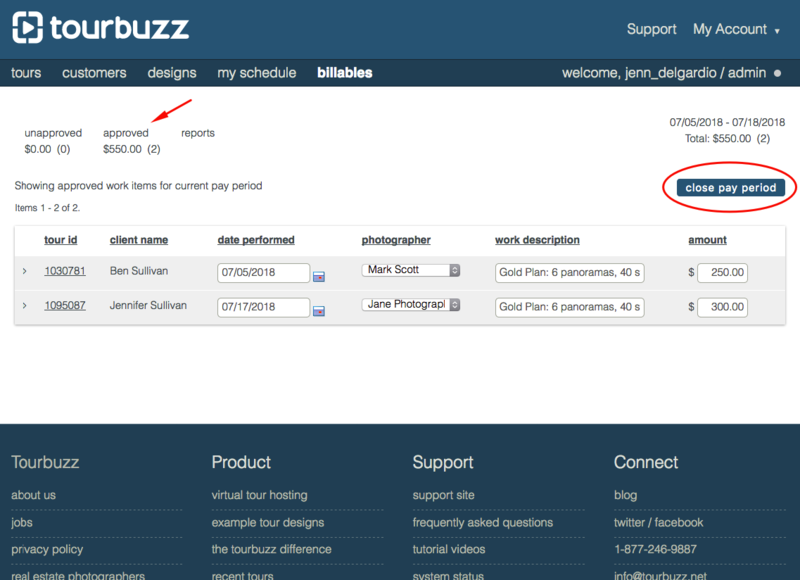 If you would like to start using billables and do not see the billables tab under the Tourbuzz logo, let us know by emailing us at support@tourbuzz.net! When you first click on the billables tab, you will be presented with a screen that walks you through setting up your account. 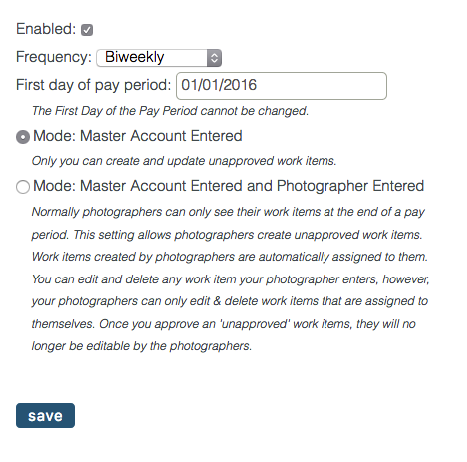 Here you are able to set your pay frequency, first day of pay period and determine whether or not you would like to allow your photographers to enter their own work items. If you need to make any changes to your settings, you can do so at any time by heading to My Account > Photographers > Go to Billables Setup (found under the search box). Work items can be created by the master account holder and the photographer (depending on how billables was initially set up). Creating work items will look and work the same for the master account holder and a photographer however, work items created by photographers are automatically assigned to them. A master account holder can edit and delete any work item a photographer enters, however, photographers can only edit & delete work items that are assigned to themselves. Click on add new on the right side of the billables page. Work items can be associated with a tour & customer however, you may create work items that are not associated with either. To associate a work item with a tour, click add new & under the tour id column start typing the ID, title or tour address. If the information entered is recognized, a dropdown will appear with options to choose from. Once the tour is selected, the customer’s name that is associated with the tour will automatically appear under Client Name. *Note: to create a work item that is not associated with a tour, simply leave the tour id box blank and enter in the information specific to the work item in the work description field. The next steps are to add the date performed, add the photographer, and add a work description and finally, amount owed for the work item. It’s possible to create more than one work item per tour. It’s possible to save incomplete work items and finishing entering information when available. Billables tries to automatically generate “suggested” billables for your tours to help save you time. Suggested work items will automatically show up if you have a scheduled shoot date within your pay period and a photographer assigned to that shoot. If the tour was created by the customer placing an order on your order form, the suggestion engine will try to create one work item per each a-la-carte item from their selected Order Form packages. Here you will see 3 work items were automatically created for the tour. 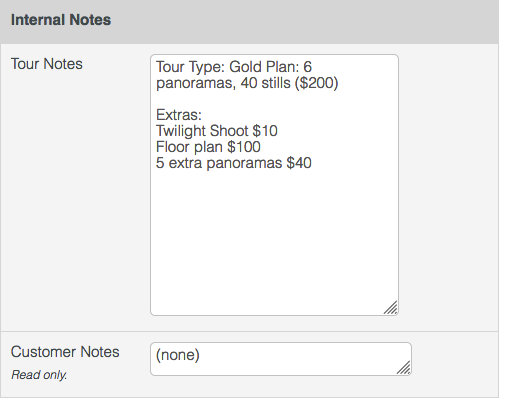 1 for the twilight shoot, 1 for the floorplan and 1 for 5 extra panos. Once work items are created and ready to be approved, simply click on the checkbox on the right side of the work item under the column that says all. To approve all items at once, click on the word all and this will check the box for all work items. The next step is to hit approve. Note: Date performed, photographer, work description and amount are all required in order to approve a work item. At the end of a pay period, after all your work items have been approved, you are able to close your pay period on the "approved" tab of billables. If any work items need last minute updates or changes, click on the work item and change/update the information before closing out the pay period. Note: All work items must be approved in order to close out your pay period. After the pay period has been closed out, reports will be generated to track total work items and payouts per photographer. Reports can be exported as a .csv file and will display totals for the payout period, or details for the payout of each photographer. Note: Your photographers will only have access to their generated report. The first report that you'll see is the totals report. This report allows you to quickly see how much you owe each photographer and how many work items they've completed within the pay period. The next report you'll see is the details report. You can access this report by clicking on the totals dropdown found next to the export button. Here you will see a detailed report of what you are paying out each photographer for. You are able to filter this report further to see a details report specifically for each of your photographers.